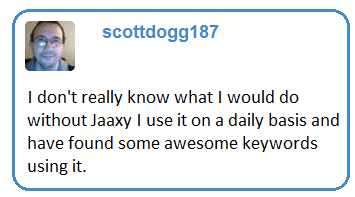 In the detailed review below I am going to show you some great (and extremely beneficial) things about the excellent Jaaxy Keyword tool. True, there are tons of keyword tools out there, and it can be tough to decide which one is best for you. So therefore, the Jaaxy Review here is to give you some perspective on the topic and why you should consider Jaaxy as your keyword tool. You will learn, what Jaaxy is, why it was created and how it outperforms other keyword tools on the market today. Jaaxy Keyword Tool is created by skilled internet marketers Kyle and Carson, who also founded the online training platform Wealthy Affiliate. Wealthy Affiliate is to help you start your online campaign from scratch. Jaaxy, on the other hand, is high-quality keyword tool to help you find low competition keywords for your campaign. The problem that these two seasoned internet marketers Kyle and Carson faced was that there were no quality keyword tools available. There were plenty of tools for sure (free and payware), but none of them could save their time while performing keyword research. In fact, Kyle (one of the founders of Jaaxy and Wealthy Affiliate) said that for almost a decade (from 2002 to 2010) he preferred to use a free Google Keyword Tool and his manual research techniques to find keywords. It was not that he could not afford a good keyword tool. He already made $10,000s per month as an affiliate at that time. So why a skilled and successful internet marketer with tons of money in hand does not use any of these keyword tools on the market? And this for almost a decade? The answer is simple: He could perform much better and much more efficiently using his “manual” techniques than any other keyword tool could offer him! Another problem with the existing keyword tools was that although they provided all kinds of metrics and numbers, their data was useless. Just fluff. The data was often outdated and did not help them in any way. So in 2009 Kyle and Carson decided to create their keyword tool that they would benefit from. Having years of experience, they knew just exactly what a keyword researcher needed, what a website owner needed and what an excellent keyword tool had to provide. So they went to the drawing board, and nine months later Jaaxy was born – easily the World’s Most Advanced Keyword Tool on the market today. So you see, Jaaxy is built by Internet Marketers for Internet Marketers. Jaaxy Enterprise is a more powerful version of Jaaxy. The creators of Jaaxy were super users, so they wanted a tool for super users. They decided to make Jaaxy even more efficient and time-saving. It took them 12 months of development and a huge number of “network servers” to make Jaaxy Enterprise. So what characteristics describe it? In other words, Jaaxy Enterprise is like Jaaxy in full throttle or Jaaxy on steroids. Depends. If you need an excellent tool that does its job, then Jaaxy is a good choice. But if time is vital to you (and in business it usually is) then Jaaxy Enterprise is an absolute must. If you have ever used keyword tools, you know that they provide you with lots of numbers and metrics which are often difficult to understand. In fact, in most of the cases, these figures and metrics don’t have much value. They’re pretty much useless, mostly meant to attract the customers. But regarding keyword research, their data is mostly useless. There are different reasons. Often the owners of their keyword tools are not internet marketers. They have no idea what a keyword tool has to do and as a result, they stuff their tools with tons of useless metrics. Another problem is this. The Internet is constantly evolving, and the same goes for the reasons why and how we find keywords. If you have a keyword tool, you have to keep up with the progress. If you don’t, your data is outdated. And this is the problem with many keyword tools out there. Another issue is that most of the keyword tools have relied solely on Google search results. However, when Google recently suspended accounts that were used to access this data, many of the top tools stopped working. On the contrary, the founders of Jaaxy are skilled internet marketers who know just exactly what they want from their tool. They did not create Jaaxy to sell it. They created Jaaxy for themselves. Only later they decided to put it out on the market. But they are super users of Jaaxy, and they constantly update it. 3.1. What Metrics Should You Care About? The first metric (Monthly Searches) is an estimation that Jaaxy Enterprise can accurately capture. It derives data from all the key search engines and mashes it up into one piece. If you take a Google Keyword Tool, its traffic estimates and searches are inflated. According to Google Keyword Tool, some keywords will promise you millions of searches a month. But how can it be? Getting millions of searches from one keyword only is impossible. The second metric, the QSR (or website competition) is the most important metric you need to know for getting ranked. Neither Google Keyword tool nor any other keyword tool out there today gives you website competition, except Jaaxy. And Jaaxy Enterprise does it in an instant. The third metric is based on “common sense”. Don’t use keywords that don’t make sense, even if they have high monthly traffic and low competition. You write for people, not for search engines. Google is way smarter than you think. It understands when you want to game it and punishes you with a low ranking. A good keyword is the one with a high number of searches and low competition, right? Regarding competition, the Google Keyword “competition” and Jaaxy’s QSR are totally different metrics. In the Google Keyword Tool competition is “Advertiser Competition”. It DOES NOT relate to the Google organic search results. It is related to a number of advertisers who are bidding for that keyword. It can be “low”, “medium” or “high”. On the other hand, Jaaxy calculates QSR which is “website competition”. It shows, how many sites compete for that EXACT keyword. To get the picture, let’s take a keyword “raw juices diabetes”. If you google it, you get over 8 million results. However, these 8 million results are not exact matches. 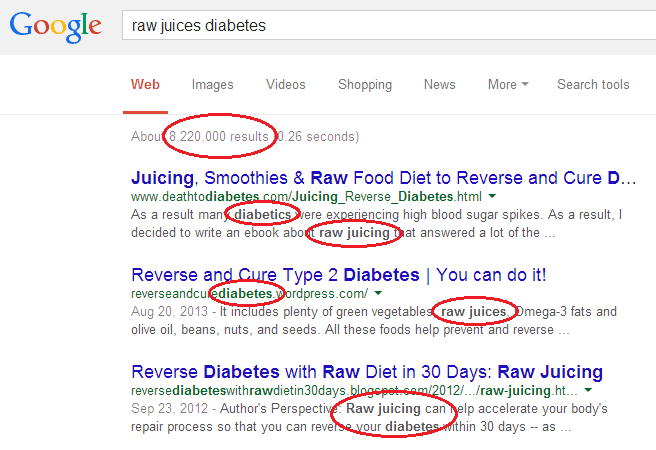 There are “diabetics /…/ raw juicing“, “diabetes /…/ raw juicing“, “raw juicing /…/ diabetes“, etc. Now use “” to find the exact matches of this keyword. You get only 5 competing websites! 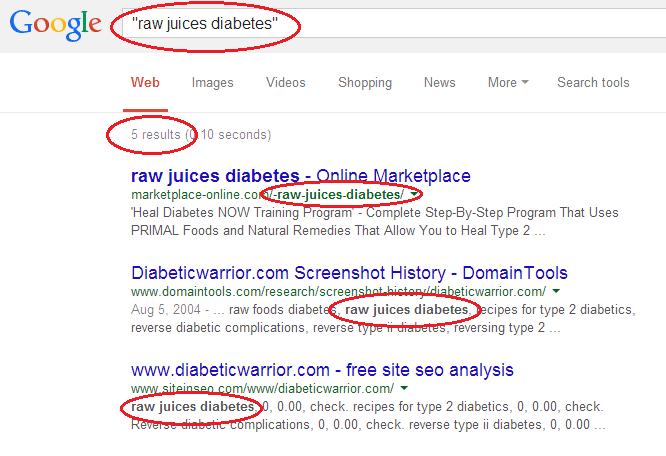 So with all those hundreds of millions of websites worldwide there are ONLY 5 websites that compete for the exact keyword “raw juices diabetes”! What does it mean to you or how it is beneficial to you? If you create quality relevant content using this keyword in your title and first paragraph you get a very high ranking from search engines. That is why website competition or QSR is so crucial when you are researching keywords. A keyword with less than 300 competing websites in Google gives you excellent chance to get a high ranking. Have you ever heard “Time = Money”? It’s clearly true in the business world, and if you have ever run a blog or a website, you know that you are always in search of more time. Jaaxy founders were facing the same problem. They created a keyword tool that would save their own time! 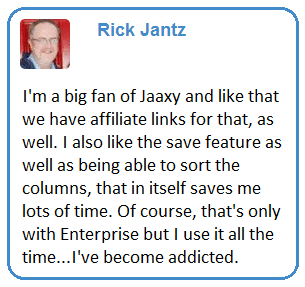 My experience with Jaaxy Enterprise is the same – It saves me many hours every week! I can use these hours to put more quality into my content. I can do that because I know Jaaxy Enterprise does its job FAST. Why are there these differences between statistics from Google Keyword Tool and Jaaxy? Simple. Google derives its data only from Google searches. Jaaxy, on the other hand, gets its data from Google, Bing, Live, and the other main search engines, then it mashes it up. By now, it should be clear why Jaaxy statistics is more accurate. Compared to other keyword tools, Jaaxy is very simple. It’s easy to learn and easy to use. Jaaxy is a web based tool so you can access it even from your phone and tablet. Also, Jaaxy stores all of your search history so you can find it later. Very convenient way to save your ideas! Let me give you two quick examples to show you how easy it is to find low competition keywords that have less than 300 competing web pages in Google… and in the whole world. Let my first niche be “how to cook Chinese food”. I don’t know anything about it so let’s see what keywords I can find. As you see, with just one search, Jaaxy provides me 21 low competition keywords that I can use to start a new online campaign. Very fast and very simple! Now let’s take another niche… “Adult diaper”. It is a niche that I know nothing about. So let’s see what keywords Jaaxy gives me. 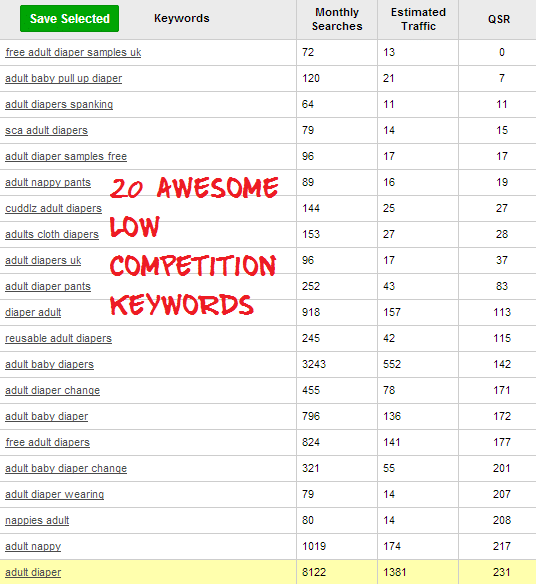 Again, awesome keywords with low website competition that I could use to build my website and target this particular niche. As you see, with only two searches and less than one minute, I have plenty of low competition keywords to start two different campaigns in 2 different niches. 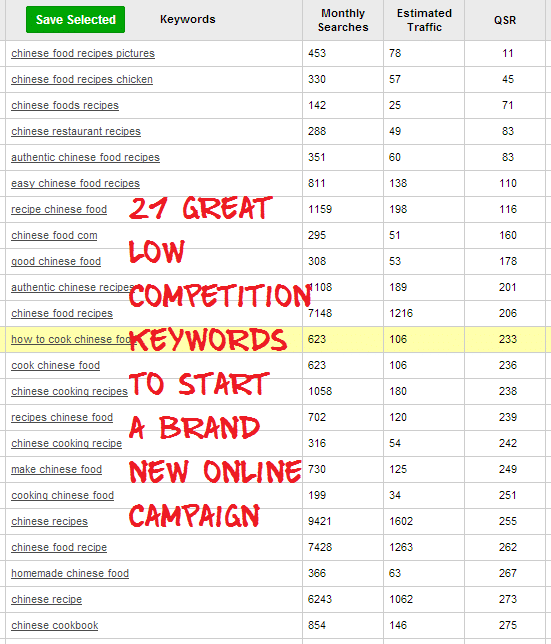 Use keywords that have more than 100 searches a month (to get some traffic) and QSR less than 300. Regarding traffic, what’s the point if your keyword has 10,000’s of traffic but the website competition is high, and you rank on Google SERP page 15 with your keyword? Always aim for lower QSR. Up to now we have just scratched the surface of Jaaxy – the advanced keyword research tool that goes above and beyond most keyword research tools available today. Keyword lists – create and save your awesome keywords in different lists. There are three different versions of Jaaxy for any budget – from starter to super user. Jaaxy Enterprise = $49 per month, $499 per year. Choose the Jaaxy version that suits you here. I use Enterprise personally because I don’t have much time, and I cannot waste it. I would rather use my time to put more quality into the content I write. I have only limited hours every day, so I want to use my time as efficiently as I can. Jaaxy Enterprise helps me greatly. 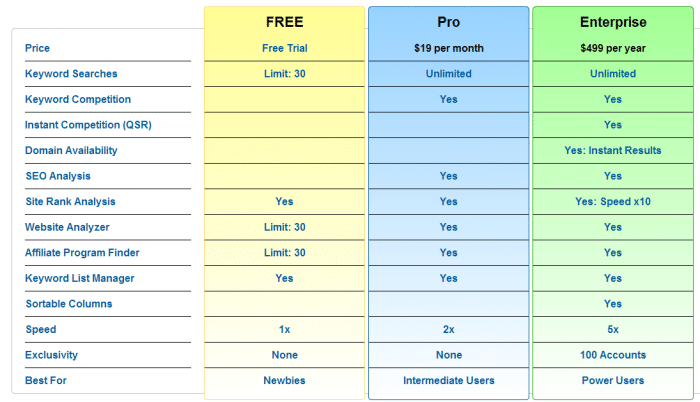 If you are not sure what to choose, try the free version first. It will give you a good picture how Jaaxy works. The second version, Jaaxy Pro, is a powerful keyword tool and has most of the functions within Enterprise, only Enterprise is way faster.